These socks . . . they were an experience. Start at the cuff, work down the leg in pattern, then put the back on hold and continue working down the top of the foot. Around the ball of the foot, cast on additional stitches for the sole and continue working in the round until you think you should start the toe, then start decreasing (the pattern includes a special toe, I didn't bother with it). Then go back and add the heel. I like this in theory. It gives the sock an interesting new look, and makes it possible to re-heel the sock if it wears through. In practice, though, I found it too fiddly--stitches on holders, provisional cast-ons, attempting to guess where the toe should start. 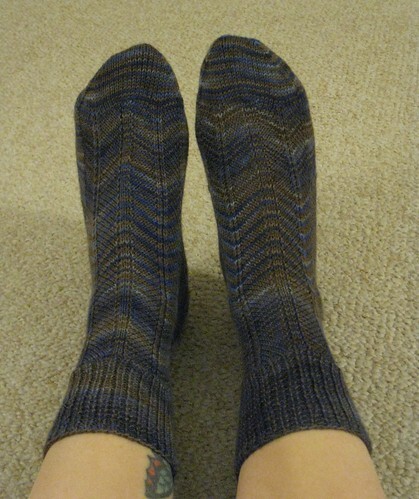 Socks can be tricky enough without all of that extra fiddling. The point at which you should start the toe seems to have tripped up many knitters. Without the heel and bottom of the sole in place, it's difficult to determine how long the entire foot should be--if you're working on circular needles, you can try the sock on, but with no heel, it's easy to slip the foot portion forward or backward too far, which skews the measurements. Many knitters suggested putting the toe stitches on hold until you do the heel--but then that's even more fiddling. 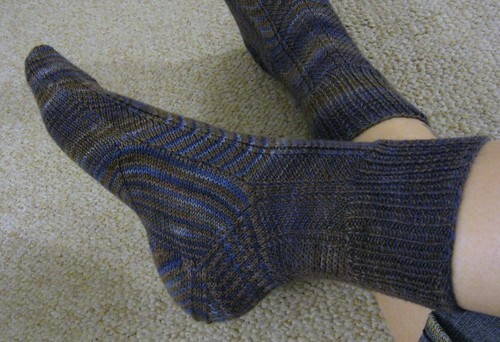 I like the way these look, the striping effect of the yarn is fun, and I am fond of the way a series of stitches wraps around the back of the heel. But the foot did come out a bit too short (you can see the back of the heel slipping under my foot a bit) and unless my socks suddenly develop a tendency to wear out at the heels, I don't think I'm likely to make this my new sock method. I've already started on February's socks using some DIC Smooshy. I'm trying these Business Casual socks, which will be for me, but they're quite unisex, so maybe someday, CP will get a pair. Possibly. I am now faced with the challenge of selecting projects to bring with me to Peru. I need airplane knitting (for which I'll want the least threatening-looking needles so they'll make it through security), and then "gee, we still have 45 minutes until dinner, what shall we do?" knitting. And I have so much on the needles: socks, 3 sweaters, a baby sweater, and a shawl I've barely started that needs a lot of work. It requires some serious thought, so I don't panic at the last minute and pack it all. In extremely exciting news, we'll be visiting Cuzco for a few days and have made plans to go to Awana Kancha! The website is, sadly, a bit pitiful, but after clicking a lot of broken links, I managed to discover that they have both dyeing and spinning demonstrations! And of course, alpacas. I've actually been to Awana Kancha once before, on my first trip to Peru--sadly, I wasn't a fibre enthusiast at the time, so I really didn't appreciate what I was seeing. I can't wait to view it all through new eyes.